The people and their passion are what made Route 66 special and unique. However, from its inception Route 66 has been an artery of commerce. On both counts nothing has changed. This mornings focus was two fold; the business of Route 66 and the people that make it special. First, I sent Dave Alexander some new additions for the Jim Hinckley’s America Gallery at Legends of America, your one stop shop for prints that are sure to inspire a road trip or two. Today’s additions to the gallery that included scenes from Hackberry and Valentine were souvenirs from the Sunday afternoon adventure. Werner Fleischmann, an associate from Switzerland that is renovating several historic properties in the Kingman area had requested that I meet with him at the model home for his Green Wood Village development south of Hackberry for some uninterrupted informal discussions. This was followed by the completion of a detailed report pertaining to the utilization of Route 66 as a catalyst for development and revitalization of the historic district in Kingman. Since the 2014 Route 66 International Festival rather dramatic things have been taking place in the city. This morning I received notice that large new sign is being erected at the Powerhouse Visitor Center. 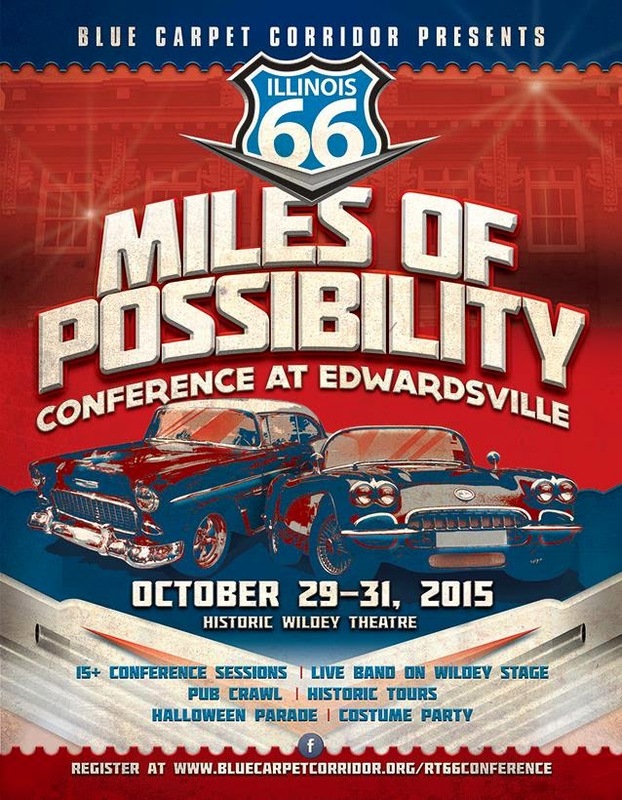 This will provide the Route 66 Electric Vehicle Museum with a promotional boost. I also spent some time working on a presentation that will be made at the Miles of Possibilities Conference in Edwardsville, Illinois on the last weekend in October. Needless to say, as the conference schedule includes presentations by personalities and experts in their field such as Jim Ross, Jerry McClanahan, Kaisa Barthuli, Larry Clonts, Swa Frantzen, Anne Slanina, and Bill Thomas, I was quite honored by the request to participate. The event is shaping up to be a near perfect blending of the fun filled Route 66 family reunion that is so much a part of these events, and the business of Route 66. Here is a link for a website with details about the activities planned, and the speakers at the conference. There was also a bit of time spent working on the travel outline for the trip to Edwardsville. This will be another working holiday (of the best kind) as we will need to develop a new photo portfolio for the next book. That takes us the people aspect of the morning. On Saturday, I had a lengthy and interesting discussion with Candacy Taylor about some of her developing projects, and the transitional state of the publishing industry that includes the increasing trend of productive, talented, and seasoned authors living one step above the poverty level resultant of the current standards pertaining to advances, royalties, marketing, and reading trends. This is not an issue limited to writers in this county, it is an international problem. Lately, the issue has been generating main stream media interest. This link is for a story published in London, and this one is for a related feature. Candacy has completed an array of interesting projects. The current endeavor will shine light on some of the most obscure and interesting aspects of Route 66 history, some of which has been in the shadows for far to long. If you are unfamiliar with her work, I suggest that you take a few minutes to check out her website. This morning I began gathering some of the contact information she will be needing for the latest project. I am quite eager to watch this develop. Then I turned attentions to my newest endeavor that only has to clear budget approval and negotiations to receive the green light. The next Route 66 title will be a bit unique. The initial request from the publisher was to craft an outline for a book that would provide the armchair traveler with an opportunity to experience a Route 66 odyssey, and yet, it would also need to be a book that would encourage and assist the first time Route 66 traveler. As it if that wasn’t enough of a daunting challenge, it would also need to be a book that would benefit the seasoned Route 66 traveler and enthusiast. Developing a concept that met the publishers criteria required a number of very long walks, and some discussions with my dearest friend who also happens to be a very insightful adviser. The cornerstone for the endeavor will be the people; the characters, the business owners, the international legion of enthusiasts, and the visionaries. So, this morning I composed a list of people to interview for the book, and began composing a list of key questions. As always, I am eager to begin a new and challenging project. There is a bit of that old familiar apprehension. So goes, the fun, and the business, of Route 66.